Aquaculture production can yield significant economic, social, and environmental effects. These exceed the financial costs and benefits aquaculture producers are faced with. We propose a methodology for the development of integrated production models that allow for the inclusion of the socio-economic and environmental effects of aquaculture into the production management. The methodology develops on a Social Cost-Benefit Analysis context and it includes three parts: (i) environmental, that captures the interactions of aquaculture with the environment, (ii) economic, that makes provision for the incorporation of economic determinants in the production models and (iii) social, that introduces the social preferences to the production and management process. Alternatives to address data availability issues are also discussed. The methodology extends the assessment of the costs and benefits of aquaculture beyond pure financial metrics and beyond the quantification of private costs and benefits. It can also support the development of integrated models of aquaculture production that take into consideration both the private and the social costs and benefits associated with externalities and effects not appropriately captured by market mechanisms. The methodology can support aquaculture management and policies targeting sustainable and efficient aquaculture production and financing from an economic, financial, social, and environmental point of view. Aquaculture management often targets output maximization rather than profit maximization. This tactic is economically inefficient but may also be associated with social and ecological risks. In order to achieve the goals of efficient and sustainable aquaculture development, both the environmental and socio-economic impacts of aquaculture should be identified and monetized, with ultimate goal to be explicitly incorporated in the aquaculture production and management decisions. Aquaculture depends directly, but also impacts, on the availability and the quality of the marine resources and the environment. It also interacts with socio-economic parameters in a way that the costs and the benefits of aquaculture extend beyond monetary expenditures and revenues. There is a general consensus among policy makers and resource managers that the sustainability of ecological and economic systems is tightly coupled. Nevertheless the interaction among the latter is complex and it makes informed resource decision-making extremely difficult, especially when considering the dynamic nature of ecosystems and the difference in the scale of analysis of ecological and economic systems. The research on the development and the integration of ecological and socio-economic models for aquaculture is ongoing. In these efforts several conflicts such as the scale of analysis, the communication between ecology and economics, and the implicit assumptions employed, have been identified in a way that explains the decoupling of these two disciplines (Bockstael et al., 1995). Recently, there have been proposed in the literature several integrated ecological–economic models for aquaculture characterized by lower complexity as compared to the biological and ecological models alone (see for instance Bulte and van Kooten, 1999; Armstrong, 2007; Drechsler et al., 2007). These models can be categorized into bio-economic models, models integrating complex environmental and economic parts and linear models (see Jin et al., 2003 for a detailed discussion). This paper aims at complementing the research on the modeling approaches to aquaculture production by bringing socio-economic and environmental impact into consideration when analyzing aquaculture operation performance and production management. Toward this end we develop a methodology for the conceptualization, the identification and the monetization of the socio-economic and the environmental impact of aquaculture and for its combination with the production models of aquaculture, taking into account data and computational resources at reach. For this purpose, we analyze aquaculture through a Social Costs Benefit Analysis (SCBA) lens in which the total economic value of costs and benefits of aquaculture is identified, modeled, evaluated and monetized. To the best of our knowledge, the approach we propose is novel, not implemented before in aquaculture production models, thus can be the first of its kind promoting an environmentally, financially, economically and socially sustainable approach to aquaculture production management. SCBA systematically identifies, organizes and valuates the benefits and the costs of aquaculture. To this end we develop our methodology in stages. In the first stage the cost and benefits are identified. In the next stage they are valuated and quantified. In contrast to the costs and benefits of goods and services that have a simple and transparent measure in a convenient unit, like market prices in monetary terms, social costs and benefits are not always captured by market prices, neither are limited to easily quantifiable changes in material goods. Thus they should be regarded and quantified in a wider sense, measuring changes in individual utility and total social welfare. The proposed approach aims at: (i) extending the identification of the costs and benefits of aquaculture beyond pure financial metrics and monetary terms, and (ii) extending the modeling of aquaculture production beyond the quantification of private costs and benefits and including in the analysis the social costs and benefits. In this way: (i) it can be produced integrated models of aquaculture production that take into consideration both the private costs and benefits but also the social costs and benefits associated with externalities and effects not appropriately captured by market-driven functions and factors, and (ii) it can be provided quantified insights to the social costs and benefits that producers internalize or can internalize, which can complement policies targeting aquaculture management and financing (e.g., subsidies, environmental taxes, etc.). Moving beyond aquaculture, the proposed methodology can be applied to other production domains (e.g., agriculture), following adjustments tailored to specific production-type characteristics1. The costs and benefits considered include among other investment costs, production costs and revenues, social interactions and environmental impacts translated into effects on ecosystem services and social effects. The resulting framework, developed to support the integrated management of aquaculture production, allows for decisions that are consistent with the concepts of environmental sustainability, economic and social efficiency. We identify and quantify the costs and benefits associated to aquaculture in a way compatible to techno-economic and cost-driven production models2. The approach followed distinguishes between social, economic and environmental costs and benefits. Figure 1 provides a graphic summary of the steps taken. In case of data limitations that do not allow for the direct valuation of the impact, Benefit Transfer methods are proposed as a methodological alternative. In this way it is made use of experience and findings in other sites of similar context and useful quantified effects are inferred and made ready for use in the policy sites. Figure 1. Identification of socio-economic and environmental impact of aquaculture and their integration to aquaculture production models. 1. Environmental part, where the modeled relationships aim at capturing the interactions of aquaculture and associated costs and benefits with regards to the environment (CO2 emissions, water pollution, spatial considerations and consumer preferences, etc.). 2. Economic part that makes provision for the explicit incorporations of economic determinants (inflation, income/GDP, labor and production costs, etc.) in the aquaculture production models. 3. Social part that introduces social costs and benefits (agents' and communities' livelihoods, wellbeing, consumer utility, etc.) in the aquaculture production and management decision process. The following sections discuss the socio-economic and environmental costs and the benefits of aquaculture and the methodology to quantifying and including them in the production models. A rich body of literature on aquaculture leads to the conclusion that any attempt to assess its impacts should extend beyond production costs and financial returns. Efforts to identify and quantify the costs and benefits of aquaculture are associated to answering questions related among other to the contribution of aquaculture to economic activity and income generation, for instance contribution of aquaculture to Gross Domestic Product (GDP) and employment, to the costs and benefits that aquaculture generates apart from providing food supplies, to the social impact of aquaculture, such as rural development, regional stabilization and well-being, to the environmental effects of fish production, etc. It becomes thus evident that the effects of aquaculture and the associated costs and benefits entail a plethora of economic, social, and environmental aspects. The economic effects of aquaculture can be identified and analyzed in terms of income and employment generation (see for instance Whitmarsh and Palmieri, 2009). The contribution of aquaculture to world GDP remains limited, despite rising trends recorded in the recent years. Aquaculture has been the fastest growing food production sector in the world over the last decades. With regards to the EU, aquaculture production has been stable (approximately 1 million tones over the period 1995–2012)3. 50% of production came from fish products and 50% from crustaceans and mollusks. EU aquaculture focuses primarily on mussels (39% of total volume), trout (15% of total volume), salmon (14% of total volume) and oysters (8% of total volume). Lead producers include Spain, France, Italy, Greece and the UK, which together accounted for more than 70% of total production (2011 figures). UK leads in terms of production value (21%), followed by France, Greece and Spain (19%, 13% and 12% respectively). The Mediterranean fish farming sector and its significant development have resulted in remarkable results not only with regards to the production of domestic fresh, cheap and high quality fish, but also with regards to the creation of a socio-economic structure that directly and indirectly involves a significant number of employees, particularly in the fisheries-dependent areas of the region. Mariculture in the Mediterranean has developed to be the only productive activity that has colonized uninhabited islands and rock-islands which are normally excluded from other investments4. Studies on the costs and the benefits of aquaculture drawing from the international experience show that employment dependency of aquaculture can be significant. For instance Burbridge et al. (2001) note that mariculture in the do Ria de Arousa in Spain links to 25% of the local employment. In Finland aquaculture employment dependency stands at 20.6% in Houtskari, 17.2% in Iniö and 15.5% in Föglö. Employment emerges as a primary benefit, especially in areas of deprivation and rural communities where large farms can be created. However it has been found that over time employment numbers may decline due to technology improvements and subsequent labor replacement (Burbridge et al., 2001). Additional economic costs and benefits of aquaculture are associated with the large initial capital investments required. Aquaculture effects have also been identified in terms of the required investment in infrastructure and the demand for traditional skills (White and Costelloe, 1999). Within the local economies, such elements may contribute to emigration reduction and maintenance of traditions and culture providing stability, especially to peripheral communities. White and Costelloe (1999) argue that these elements assist in the maintenance of identity and culture. Aquaculture attracts much attention from the public authorities as a means of utilizing natural and national resources. This is driven by the significant social function of aquaculture at regional level, particularly in regions with depressed and marginal local economies. Coastal towns and cities are often reliant on aquaculture activities not only for income generation but also for other social impacts (Symes and Phillipson, 2009). 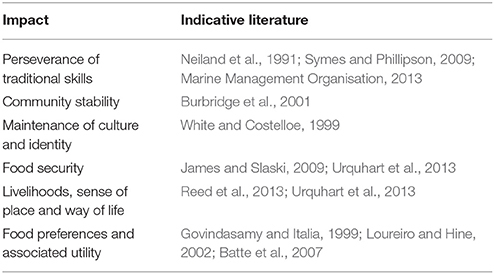 Social impacts (see Table 1 for a summary and indicative literature) can be defined as the positive and negative effects that aquaculture has in terms of: way of life, culture, health and wellbeing (IAIA, 2003). As noted in the Marine Management Organisation (2013) report, social impacts vary by occurring scale (individuals, communities), time (current, future) and results (positive, negative). Communities and societies benefit from increased food security, biodiversity and way of life (James and Slaski, 2009; Reed et al., 2013; Urquhart et al., 2013). These benefits can result in better quality of life and wellbeing of coastal communities. The UK Marine Management Organisation (2013) drawing from the experience of the UK, shows that the structure of aquaculture farms is quite unique as the majority are micro businesses employing mainly people at the age range of 16–44. The same studies also show that the majority of the proprietorships are held by men. In addition female employment dominates the on-shore processing activities. Table 1. Social impacts of aquaculture. Neiland et al. (1991) review the aquaculture sector in Europe aiming at the identification of the associated social costs and benefits. The authors, with reference to the Scottish salmon farming, discuss the concern that communities that switch away from traditional occupations may be vulnerable to external shocks. The benefits to the consumer were also identified as a result of lower prices (resulting from higher supply) and higher quality. Additionally, with regards to the West of Scotland, they also note that aquaculture offers community stability and development through the provision of full-and part-time job opportunities. This impact in terms of community stability is also inferred in other studies (for a review see Burbridge et al., 2001) where it is recognized that aquaculture can provide opportunities for part-time work, adding thus to income stabilization and beneficial social impacts. An additional benefit of aquaculture has been identified to be the restocking of certain species that can be useful for commercial tourism. Other benefits have been associated with the wellbeing and consumer preferences associated with local food production and consumption of goods that are produced at close proximity. Availability of fish varieties grown locally and with specific environmentally friendly methods or food input, satisfies increasing consumer demand for eco-friendly produced food (see Govindasamy and Italia, 1999; Loureiro and Hine, 2002; Batte et al., 2007). With regards to the environmental effects of aquaculture, studies to date have focused on the ecosystem impact, waste generation and their effects on water quality, marine life and, ultimately, consumer health. 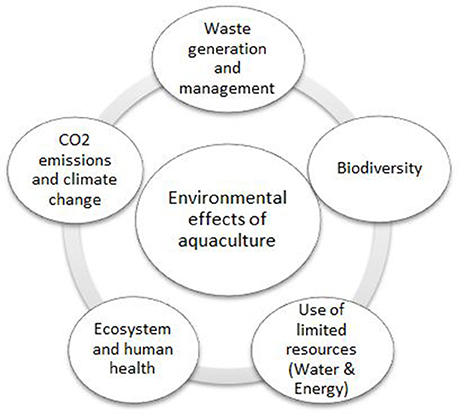 A schematic representation of the main environmental effects of aquaculture identified and discussed to date is presented in Figure 2. Aquaculture can result in significant disposal of organic waste and contaminated water into the natural environment around the farm sites. This can result in algae growth in the surrounding waters that can prove fatal for certain marine animals and indirectly constitute a danger to consumer health from consuming contaminated fish. In other cases coastal ecosystems may face serious threats as they are destroyed in order to make room for intensive aquaculture5. Figure 2. Environmental effects of aquaculture. Another environmental outcome of aquaculture is associated to the impact of the farmed fish on local wild fisheries and endangered species. Disease and parasite outbreaks in farms can spread among farmed fish but also among wild fish populations. Although disease outbreaks can be combated with the use of antibiotics and other chemicals in fish feed, further concerns arise as such actions can pose serious threats on the surrounding ecosystems but also on consumers' health. Environmental concerns on aquaculture further relate to the possibility of farmed fish escapes where in such case competition for food with wild fish can lead to their displacement. The selection of farmed fish is often based on characteristics that make fish unsuited to living in the wild. Nevertheless a certain number of fish may escape and put pressure on the natural environment and the wild spices impoverishing the genetic heritage and exacerbating the struggle for survival of native species. Escaping farmed fish may interbreed with wild fish and affect the gene pool of the wild stock. In many cases of aquaculture genetic engineering techniques on the farmed species (genetically modified fish) are used, that are often not subject to external controls. Research on this sector has been growing rapidly aiming mainly at sterilization, speeding up growth rates and increased resistance to cold and disease. To date little is known on the effects of genetic engineering techniques on human health. However their impact on marine environment has been studied more thoroughly and research suggests that the sudden presence of this type of aquaculture in natural environments represents a potential disaster. In many cases, high quantities of forage fish are used so as to feed the farmed fish. These practices make sense from a commercial point of view as the farmed fished command much higher prices than the fish used to feed them. Nevertheless, two closely related problems emerge: Fist, forage fish, such as sardines, mackerel and herring, are also edible and second it might be the case that ultimately the quantity of fish used for feed exceeds the quantity of fish produced, putting high pressure on wild fish stocks. Additional environmental concerns are associated to water and energy use and to the impact of aquaculture on climate change. Both water and energy remain limited resources in high demand in aquaculture. Aquaculture systems, particularly land-based ones, require important amounts of water and electricity (for pumping water, cleaning and filtering). Energy use is further associated to the CO2 emissions of aquaculture processes and stages and their impact on climate change. Studies to date vary in what processes they chose to include in their calculations when estimating emissions. For instance it may be considered emissions from energy use in feed blending, from energy use in transportation of feed materials and compound feed, from the manufacture of feed packaging, etc. Some aquaculture operations have been identified having a positive impact on the environment as well as on human health. Indicatively, farmed fish are generally free of environmental contaminants such as mercury and heavy metals, since they eat exclusively human-processed feed for which toxin levels are regulated. Furthermore, filter feeders farming (e.g., shellfish) can improve water quality. Aquaculture is also viewed as an activity which can contribute to the conservation of specific habitats contributing to biodiversity maintenance (Burbridge et al., 2001). It should be noted here that the nature and magnitude of the environmental effects of aquaculture depend in large upon the species farmed, the intensity of production and on the location of the farm6. 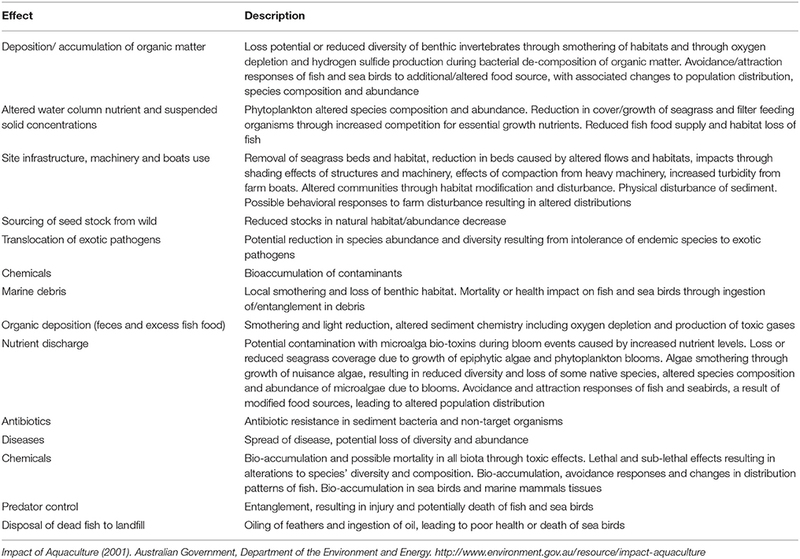 A summary of selected environmental effects and brief description is provided in Table 2. Table 2. Description of selected environmental effects of aquaculture. These quantify the private but also the social costs and benefits of aquaculture as identified in terms of economic, environmental and social outcomes. Appropriate relationships are formulated with the aim to be incorporated in the techno-economic and production models as presented below. Extended annual benefits and costs reflect the monetized value of socio-economic and environmental impacts. The criteria to assess the aquaculture investment and production are as follows: In case NPV > 0 the project is defined feasible in financial, economic, environmental and social terms while in case NPV < 0 it is not financially, economically, environmentally and socially feasible. In case NPV = 0 the investment and projected production are rendered as indifferent. The costs and benefits to be included in the NPV estimations are broken down in core components as presented next. In this way price projections that aquaculture producers are faced with in the techno-economic and cost driven production models incorporate inflation costs and expectations. In estimating the price that the aquaculture producer will be faced with, the models can consider the food preferences and attitudes of consumers toward specific aquaculture practices (environmentally friendly, natural veggie-based feed etc.) or toward spatial characteristics of aquaculture (preference to locally farmed fish over imported, etc.) and the associated costs and benefits. The costs and benefits associated with consumer preferences and wellbeing can be modeled via a price premium added or subtracted from the market price that the producer is faced with, i.e., in an X market price a price premium y% is added in the case of the locally/veggie-based bred fish so as to reflect preference over it from the consumers' side. In this case the premium reflects the willingness of the consumers to pay a higher price for locally produced or environmentally friendly aquaculture production. Premium: Price premium reflecting consumer preferences and willingness to pay. Consumer preferences and willingness to pay can be revealed and quantified via questionnaires and choice experiments. In the case such primary data are hard to obtain, earlier evidence and findings in the existing literature can be used so as to quantify the price premium applied. Several studies show that over the last years consumer demand for niche products, such as natural and/or locally grown, has increased considerably (see Dimitri and Greene, 2002). Foods produced locally or with a particular technology are valued differently because they are perceived as healthier, more environmentally friendly, and more supportive of small scale and local rural communities. This preference may translate in a willingness to pay a premium price for that product (see for instance Govindasamy and Italia, 1999; Loureiro and Hine, 2002 and Batte et al., 2007). 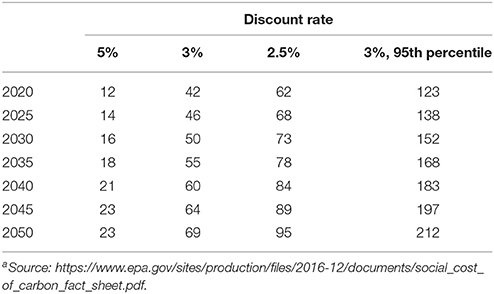 In the case of fish products the price premium (Table 3) that consumers are willing to pay for naturally fed or locally grown fish is quantified to range between 38 and 44% (see Johnston et al., 2001; Jaffry et al., 2004; Dasgupta et al., 2010; Davidson et al., 2012 among others). Table 3. Price premium for naturally fed/locally grown aquaculture products, in % of price. This evidence is based on preferences in developed economies with similar incomes and food attitudes to European ones. Therefore it can be assumed that this range of price premium is applicable to the products of the aquaculture sites modeled across EU. In order to render robust estimations, sensitivity analysis can be performed where the lower and upper bounds of the price premium are applied in order to estimate the NPV of aquaculture production under alternative consumer preferences. 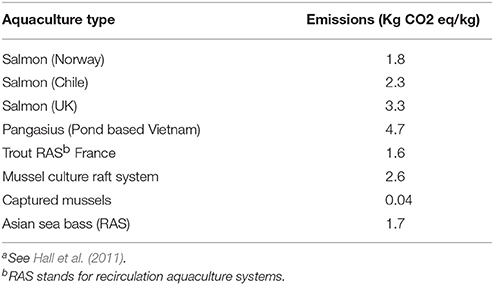 Several studies have been performed on the estimation of emissions of aquaculture systems (see Hall et al., 2011). A summary of findings is provided in Table 4. Most published research develops a Life Cycle Assessment data approach (Aubin et al., 2009; Iribarren et al., 2010a,b,c; Pelletier and Tyedmers, 2010; van den Burg et al., 2012; Hagos, 2013; see Rasenberg et al., 2013). In order to assess the impact on global warming of the production of a specific product most studies quantify emissions of carbon dioxide- CO2, methane-CH4 and nitrous oxide N2O. Table 4. CO2 emissions of aquaculture sourcea. The task of appropriately capturing and quantifying the climate change impact of aquaculture is ongoing. In addition the literature remains incomplete in estimating the CO2 emissions for all the different aquaculture types. Thus any use of the estimated values of CO2 equivalent emissions of aquaculture should be made with caution and any introduction of climate change associated costs of aquaculture in the estimation of the NPV should be made with care and without disregarding the methodological limitations. In an attempt to address this shortcoming, the emission-related environmental costs of aquaculture can be made with the use of an average estimation of CO2 emission. From the findings summarized in Table 4 results that the estimated emissions range from as low as 0.04 kg of CO2 equivalent per kg of production to as high as 4.7 kg of CO2 equivalent per kg of production, with an average (unweighted) of 2.3 kg of CO2 equivalent per kg of production. These values can be set as the lower or upper bound and the reference value of CO2 emissions in the aquaculture sites modeled. Carbon price projections to 2050 can be obtained from the EU Reference Scenario 2016 developed by the European Commission7. The EU Reference Scenario is one of the European Commission's key analysis tools for energy, transport and climate action. The carbon prices to 2050 used in the Reference Scenario can be employed in the estimation over time of the emission related costs (and benefits in case of emission reduction) of aquaculture8. To ensure robustness of estimations but also to be able to perform sensitivity analysis, additional estimations on the social costs of CO2 can be employed in the formula estimating the climate change-related costs of aquaculture. In this alternative approach it is proposed the use of social cost of CO2 estimations provided by the USA Environmental Protection Agency. The social cost CO2 serves as an estimate of the economic damages or benefits associated with CO2 emissions. These CO2-related social cost and benefit estimations reflect climate change damages and account for changes in sectoral productivity, health and energy system costs. The development of the social cost CO2 estimations consider the economic, physical and ecological impacts of climate change as recognized in the relevant literature, nevertheless several additional impacts remain not appropriately captured because of a lack of data and of appropriate modeling methodologies. Nevertheless the social cost estimates of CO2 remain still a useful measure to assess the costs and the benefits of changes in CO2 emissions. The timing of the emission release remains important for the estimation of the social cost of CO2 that is based on a present value calculation. The integrated assessment models estimate the post-emission damages up to 2300 and estimate the present value of the social cost of CO2. Thus for instance the social cost of CO2 for the year 2020 represents the present value of climate change damages that occur between the years 2020 and the final year of the model run. The damages are associated with the release of one ton of carbon dioxide in the year 2020. The 2009–2010 interagency group recommended a set of four social cost of CO2 estimates for use in regulatory analyses. The first three values are based on the average social cost of CO2 from three integrated assessment models, at discount rates of 5, 3, and 2.5%. Estimates based on several discount rates are included because the literature shows that the social costs of CO2 estimations are highly sensitive to the discount rate and because no consensus exists on the appropriate rate to use for analyses spanning multiple generations. The fourth value is the 95th percentile of the social cost of CO2 from all three models at a 3% discount rate, and is intended to represent the potential for higher-than-average damages. Table 5 summarizes the social costs of CO2 that can be employed in the assessment of climate change related costs and benefits of aquaculture. Table 5. Social cost of CO2, in 2007 dollars per metric ton CO2a. Aquaculture production entails private and social costs associated with marine water quality and waste disposal9. Although the private costs are captured to some extend from the costs of chemicals, of the production methods and of the technologies used in the aquaculture site, incorporated in investment and production costs, the social costs are not internalized. To do so in the existing production models, estimates identified in the literature can be employed. Despite the importance of this subject, evidence and quantification of costs remains sporadic (see Table 6). Smearman et al. (1997) using the case of trout production in West Virginia, USA, find that the internalized waste cost, or pollution prevention cost, would add 6% to private production costs. In another study, Folke et al. (1994) estimate the cost of marine eutrophication from salmon aquaculture in Sweden. Their valuation of the costs is based on Swedes' willingness-to-pay to remove nitrogen and phosphorous using sewage treatment plants. Their study shows that damages constitute 15–16% of production costs. Table 6. Quantified effects of water pollution and prevention costs in aquaculture. The last cost-benefit component assessed with regards to aquaculture regards the non-market valued preferences and attitudes toward ecosystem biodiversity, environmental sustainability and quality and community impacts. In the literature to date there exist several attempts to quantify these effects. Efforts are characterized by the use of different methodological approaches, case studies and range of findings10. The aspects of agents' costs and benefits related to biodiversity, environmental quality and sustainability remain quite difficult to quantify, given the differentials in preferences, attitudes and environmental status in different sites. Ideally the quantification of valuation and willingness to pay in such cases should be conducted by making use of site-specific information and data obtained through questionnaires and surveys. In the absence of access to and information on site-specific related data, a thorough review of the existing findings and literature has been undertaken so as to identify the quantified effects that are relevant to aquaculture and collect them in a comprehensive format. This information can then be used as discussed below in the NPV estimations of the different sites as appropriate. Table 7 provides a summary of indicative studies on the quantified effects estimated to date, differentiating by methodology used and aspect considered. The existing studies to date valuate these effects either in a form of a lump sum payment that agents are willing to make (for instance one-time payment that agents are willing to pay to protect the marine biodiversity) or in terms of annual payments (for instance annual payment per household that is willing to make in order to protect endangered species). In the case of a one-time payment the identified amounts can be added to the investment cost of the aquaculture site. In case of annual payments the respective amounts can be added to the NPV equation as a component of variable cost or as revenues in case of a positive net effect. Table 7. Summary of recent studies on agents' willingness to pay for biodiversity and improved environmental status. Aquaculture can constitute a significant pillar of Blue Growth targets with benefits exceeding the private benefits accrued to farm owners. Aquaculture production entails benefits to the economy, the environment and the society that extend well beyond income generation and the financial returns of the producers. On the other hand it may pose threats to the environment which are not always internalized in the market price. The literature provides several examples of production models that capture the particularities of each cultivation type (see for instance Gangnery et al., 2004; Canale and Whelan, 2014; Føre et al., 2016; Zhang et al., 2017). While many practical examples look at the private costs and benefits, recent approaches extend to the integration of ecological aspects of aquaculture (Armstrong, 2007; Drechsler et al., 2007). Nevertheless the approaches to date miss the importance of production management in an integrated manner that accounts for all the effects in a social cost-benefit context. The methodology discussed above constitutes a novel approach that considers both the economic and environmental impact of aquaculture production management with the conceptualization and the monetization of the effects, taking into account data and computational resources at reach. With the employment of a SCBA lens the total economic value of costs and benefits of aquaculture is identified, modeled, evaluated and monetized allowing for an environmentally, financially, economically and socially sustainable approach to aquaculture production management. In a SCBA context it remains an imperative for the sustainable and efficient management of aquaculture production, at micro- but also at macro- level, to identify all the positive and negative effects and to appropriately incorporate them in production function. Some of the effects might be easily quantifiable through market set prices, while for other effects no efficient markets exist providing thus little information to the producers and the society on their magnitude in monetized terms. The methodology presented here allows for introducing the wider socio-economic and environmental effects of aquaculture into the production management aiming at supporting the sustainable and efficient management of production. In doing so, the methodological and data considerations should be clearly indicated and taken into consideration. SCBA comes with advantages such as being very inclusive on many types of information, including non-marketable goods, it has a long history of application and it remains a familiar concept in research, and it can provide aggregate measures of the relative performance of different production systems. On the downside, environmental values are often hard to determine, the ecological functions are subject to changes that are hard to predict and include adequately in the analysis, the discount rates and time-related parameters may be subject to arbitrary assumptions and last, the aggregation performed in SCBA might lead to the loss of essential information. Several studies to date attempt to identify and quantify the costs and benefits of aquaculture. The study on this topic is ongoing and the list of effects is being enriched as research digs further deep into this subject. Given the analysis and data at reach, every effort is made to include as many effects as possible, and subsequently in the aquaculture production models, avoiding at the same time over-identification or double-counting issues. A non-exhaustive list of effects modeled consider the economic effects of aquaculture such as GDP growth and unemployment and labor markets effects, environmental impacts such as water pollution, emissions and social effects associated to the maintenance of social structure and wellbeing, consumer preferences, etc. The list of the quantified costs and benefits is non-exhaustive and additional parameters can be added as research progresses. The valuation of aquaculture costs and benefits has to deal with significant data limitations. These regard among others the non-existence of market-derived prices for the environmental quality and the impact that aquaculture can have on the latter, the inability to quantify the willingness of consumers to pay for differentiated aquaculture products (e.g., differentiation based on food types), quantification problems with regards to utility and opportunity costs, etc. These data limitations impact on the amount of quantified socio-economic and environmental impacts of aquaculture. Social impacts can vary by societal (individuals, communities) or time (current, future) scale and type of outcome (positive, negative). Employment of evidence from similar sites, or transfer of utility measures and valuation is coupled with advantages of ease of application and overcoming of data limitations. Nevertheless this may subject the analysis vulnerable to generalizations, or it might not capture in full site-specific effects. In order to ensure that appropriate values are transferred from one site to another, recent recommendations in the literature are followed. Recommendations based on value transfer validity tests show that studies closer spatially tend to have lower transfer errors. Studies closest in time should also be preferred for the same reason. However, this evidence is not conclusive. For instance there can be no or only very few primary studies of the environmental good in question, or the valued change in the quality of the environmental good can be outside the range considered at the site of interest, thus in this case similar databases and other bibliographies are searched for relevant studies. In principle the cost-benefit analysis should have an as long as possible time horizon. The importance of the time frame of the analysis becomes important once the environmental and social aspects are considered. Extending into the future renders the analysis vulnerable to data availability, uncertainty about future developments and preferences and risk. Thus appropriate assumptions need to be made with regards to these parameters as well as to the discount rate employed. A possible approach here could be the use of a declining discount rate (see Koundouri, 2008 for details). In case where non-market set prices exist, appropriate methods may elicit the willingness of consumers to pay for aquaculture products that result from a specific method of production. In the employment of data on the willingness to pay from existing studies, as discussed in the previous section, the following adjustments need to be made: (i) The quantified effects refer to a specific year and are measured in specific monetary terms (usually US dollars or Euro), thus appropriate transformations should be made so as to obtain the correct values for the year and currency of interest, (ii) in cases where the quantified effects are measured at individual/household level, the total of social impact as derived by the number of individuals/households affected by the aquaculture type and site multiplied by the respective value need to enter the NPV formulation, (iii) in cases where more than one aquaculture sites operate in the areas of interest, then the social costs and benefits should be allocated to all the operating sites in a way that their respective impact weight is taken as appropriate into consideration. Overall, the proposed approach allows the estimation of an integrated value of production that looks beyond output maximization. By incorporating the socio-economic and environmental effects into the production costs and revenues, externalities of aquaculture are internalized and market efficiency is improved. By also allowing producers to include a monetized value of the socio-economic and environmental impact of aquaculture into their production decision system it gives them a clearer image of the impact of their activity and its real value to the society that provides leverage in bargaining. From a policy perspective the quantified insights to the social costs and benefits that producers (can) internalize can complement policies targeting aquaculture management and financing through transfer payments and taxation. What appears complementing here is the accurate estimation and monetization of the socio-economic and environmental impacts of aquaculture and this is something future research should look at. ST and PK conceived the presented idea. ST developed the theoretical formalism. PK formulated the analytical steps. All authors provided critical feedback and helped shape the research, analysis and manuscript. We acknowledge research funding from the BlueBRIDGE project, European Commission, Horizon 2020. 1. ^This follows recent works in the literature on the importance of integrated assessment of production and resources so as to overcome existing mismanagement (see for instance Michalena and Frantzeskaki (2013) with application to energy). 2. ^The methodology presented here has been developed to complement the existing production models to which BlueBRDIGE project partners have granted access to (application of the methodology to selected aquaculture sites in the Mediterranean and scenario simulation results can be made available upon request as specific aquaculture site costs and revenues remain sensitive information). More information on the application of the methodology and results will be made available through the BlueBRIDGE project: http://www.bluebridge-vres.eu/about-bluebridge.). Focus of the analysis rests with aquaculture production in EU. However the methodology can be applied in all models that are based on estimations of Net Present Value. The research team has also developed an information technology tool that can support the methodology presented here. Details on the tool can be made available upon request. 5. ^Consider for instance the case with artificial ponds created to farm tropical shrimp where mangroves are chopped down, leading to the extinction species finding home and shelter in them such as fish of commercial value, oysters, birds, etc. 6. ^For instance finfish and shellfish aquacultures impact differently on the environment. The first is an intensive culture related to additional solids/nutrients to the environment. Organic material beneath fish farms can impact on the flora and fauna of an area and can change significantly the sediment and overlying water column. Other environmental effects may result from other farm discharges and waste products. This type of aquaculture is also subject to importing exotic species or disease transmission. Shellfish farming is associated with a net removal of nutrients. This may have a dual impact on the ecosystem: enriching with nutrient the surrounding area and competing with other organisms for survival. Similar differentiation on the impact can be considered also for shrimp aquaculture (consider for instance its effects on mangrove forest or freshwater aquaculture and its impact on lakes, water dams, and rivers). See for instance: Joffre et al. (2015), Orchard et al. (2015), and Ahmed and Glaser (2016). 8. ^The Reference scenario considers EU Emission Trading System (ETS) price and additional policies being implemented, particularly support of renewable energy sources policies, Ecodesign, etc. which influence the ETS sector allowance demand. For more information on the distinction between traded and non-traded carbon see: Department for Business, Energy and Industrial Strategy (2017). 9. ^Aquaculture waste comes in three forms: metabolic, chemical and pathogenic. Research shows that quality feeds, careful management and a well-designed culture system reduces nutrient discharges by 50% (Hulbert, 2000). The type of ingredients used in aquaculture feed also matter (Hardy, 1999). Despite their benefits in terms of environmental impact and waste management, feeding practices are less used due to the higher costs they entail for the producers. With regards to pathogenic waste, disinfection (chlorination, ultraviolet radiation, ozonation) is used in plants so as to reduce particles (such as parasitic or viral). 10. ^For instance Lawrence and Spurgeon (2007) tried to capture the willingness to pay to recover a 95% loss to wild salmon populations over the last 25 years. For this they conducted a survey over all of Great Britain. The survey revealed a willingness to pay £11.47 per household, capturing thus the perceived social costs that should be made payable by aquaculture producers. In another study Nijkamp et al. (2008) note that households surveys in UK, Norway and Germany show that households would be willing to pay 28.6 Euros annually towards biodiversity preservation, revealing thus the willingness to pay for biodiversity. Dimitri, C., and Greene, C. (2002). Recent Growth Patterns in the U.S. Organic Foods Industry (Agriculture Information Bulletin Number 777) U.S. Department of Agriculture, Economic Research Service. Govindasamy, R., and Italia, J. (1999). Predicting willingness-to-pay a premium for organically grown fresh produce. J. Food Distrib. Res. 30, 44–53. Hagos, D. (2013). Life Cycle Analysis of Fish farming: Carbon and Water Footprints. Lambert Academic Publishing. Hall, S. J., A., Delaporte, M. J., Phillips, M., and Beveridge, M., and O'Keefe, M. (2011). Blue Frontiers: Managing the Environmental Costs of Aquaculture. Penang: The World Fish Center. Hardy, R. W. (1999). Waste management in aquaculture. Aquacu. Mag. 25, 80–83. Hulbert, P. J. (2000). “Phosphorus reduction at adirondack hatchery: is the end in sight?” in Proceedings: Third East Coast Trout Management and Culture Workshop (Frostburg, MD: Frostburg State University). IAIA (2003). Why have Principles for Social Impact Assessment? International Association for Impact Assessment. Special Publication Series No. 2. James, M. A., and Slaski, R. J. (2009). A Strategic Review of the Potential for Aquaculture to Contribute to the Future Security of food and Non-Food Products and Services in the Uk and Specifically England. Report commissioned by the Department for the Environment and Rural Affairs. Johnston, R. J., Wessels, C. R., Donath, H., and Asche, F. (2001). Measuring consumer preferences for ecolabeled seafood: an international comparison. J. Agric. Resour. Econ. 26, 20–39. Koundouri, P. (2008). “The case for declining long-term discount rates in the evaluation of flood-defense investments,” in Coping with Water Deficiency: From Research to Policy Making, ed P. Koundouri (Springer Publishing), 157–164. Lawrence, K. S., and Spurgeon, J. (2007). Economic Evaluation of Inland Fisheries. Bristol: Environment agency. Marine Management Organisation (2013). Social Impacts of Fisheries, Aquaculture, Recreation, Tourism and Marine Protected Areas (MPAs) in Marine Plan Areas in England. Marine Management Organisation. Neiland, A., Shaw, S., and Bailly, D. (1991). The social and economic impact of aquaculture: a european review. Aquacult. Environ. 16, 469–482. Rasenberg, M., Poelman, M., Smith, S., and van Hoof, L. (2013). GHG Emissions in Aquatic Production Systems and Marine Fisheries. IMARES. van den Burg, S. W. K., Taal, C., Boer de, I. J. M., Bakker, T., and Viets, T. C. (2012). Environmental Performance of Wild-caught North Sea Whitefish, a Comparison with Aquaculture and Animal Husbandry using LCA, Report no. 2011–090. Den Haag: LEI. White, F., and Costelloe, J. (1999). A Socio-Economic Evaluation of the Impact of the Aquaculture Industry in Counties Donegal, Galway, Kerry and Cork. Dublin: Marine Resource Series, Marine Institute. Copyright © 2018 Tsani and Koundouri. This is an open-access article distributed under the terms of the Creative Commons Attribution License (CC BY). The use, distribution or reproduction in other forums is permitted, provided the original author(s) or licensor are credited and that the original publication in this journal is cited, in accordance with accepted academic practice. No use, distribution or reproduction is permitted which does not comply with these terms.